I love legumes of all kinds, but I’m not always together enough to soak, say, white beans the night before I want them. Many cooks address the soaking problem with a pressure cooker, which can take any bean from rock-hard to cooked in less than an hour. I don’t have a pressure cooker, so I turn to the lentil, which cooks in less than an hour without soaking anyway. Lentils may bear some of the baggage of people’s bad college cooking. In my college days in the ’80s, we were of that generation whose parents had raised us to demonize salt, so we had no idea how or even whether to use it. I remember eating too many grim bowls of mushy, gray, aggressively bland lentils at friends’ houses. But those days are long gone. Now lentils are good! These days, my two favorite varieties are red lentils, which I cook with plenty of caramelized onions and Indian spices, and the French kind, which are green. 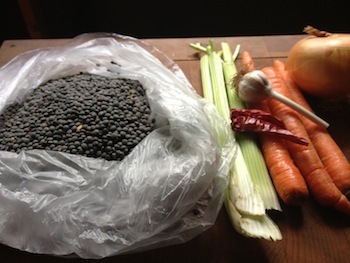 Unlike many other lentil varieties, the French ones stay firm when cooked. And they have a great rustic flavor on their own, so it doesn’t take much to make them to taste delicious, and well, French. I just cook them with what the French call a mirepoix—a mixture of chopped onion, celery, and carrots. To jazz up my usual French lentil dish this time around, I made a quick arugula and red onion salad. Over rice, or with some crusty bread, it makes a good dinner. 1) Add a good splash of olive oil to a heavy-bottomed pot, and turn heat to medium-low. When the oil shimmers, add the mirepoix vegetables and sauté, stirring occasionally, until they’re soft. Add the garlic and the chili pepper and paprika (if using), and stir. Let it sizzle for a second, and then add the lentils. Stir them in, letting them sauté for a few seconds, and add enough water to cover them by an inch or so. Bring to a boil over high heat, then cover, turn heat to low, and let them simmer until they’re tender but still pleasantly firm. Check occasionally, and be ready to add water if the lentils threaten to dry out. 2) After the lentils have simmered a while and are almost done, make the salad. Add the onion slices to a medium sized bowl and over them, tear the arugula leaves into bite-sizes pieces with your hands. Add a good pinch of sea salt, a grind of black pepper, a splash of olive oil, and a squeeze of lemon. Combine with your hands and taste, adding a little more of whatever in the dressing seems to faint. 3) When the lentils are done, season with sea salt, pepper, and lemon juice. (Actually, lentils are a great way to learn the genius of salt. 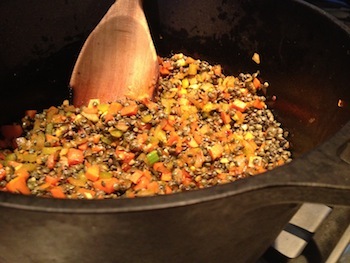 First taste the cooked lentils unseasoned, then add salt a pinch at a time, tasting after each pinch. Note how the salt draws out the other flavors out as you add it bit by bit. Be careful not to over-salt—you want to taste the food, not the salt). Distribute them among three bowls, leaving a little behind for seconds, and garnish each bowl with the salad on top. Serve with bread.